Sup fools? My name is Pig Lord. I’m a degenerate and I like to gamble on MMA. I’m not some fraud trying to sell predictions by marketing myself as the #1 expert on MMA. 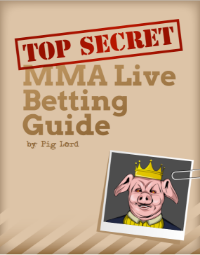 I’m just a solid capper who has managed to generate consistent profits by betting on fights for the past few years. I enjoy writing breakdowns from a gambling perspective and helping people to earn money while sitting in front of a computer in their undergarments. All predictions are free!